Large protests and rallies, public scrutiny, constant media coverage… debate and discussion about live animal export really has begun to characterise modern life. This perhaps became most apparent on Saturday, October 6th following the distribution of a video depicting approximately 10,000 Australian sheep being killed inhumanely in Pakistan. In response, thousands of people participated in rallies condoning the practice. While animal transportation within Australia is tightly regulated, there are two key reasons why we should consider reassessing the methods we currently use. The first, and most obvious one, is the fact that livestock transportation is currently in the spotlight, and has earned itself a less than desirable image. Let’s attempt to reverse this. Secondly, a new document detailing nation-wide changes to animal transportation guidelines and standards, the Australian Standards and Guidelines for the Welfare of Animals – Land Transport of Livestock (LTS) came into effect in July, so it is important that we ensure our practices operate in line with the changes. The guidelines remove all existing codes of practice, and in a first, they apply to every Australian state and territory (previously, each had their own code). They govern everything from travel conditions and maximum journey times through to the amount of time livestock are permitted to travel without food or water. Duncan Stock Grates can help you meet these guidelines as they will ensure your livestock travels in safe, reliable vehicles. The company manufactures a range of livestock crates and trailers, and the team can custom make models according to individual requirements. 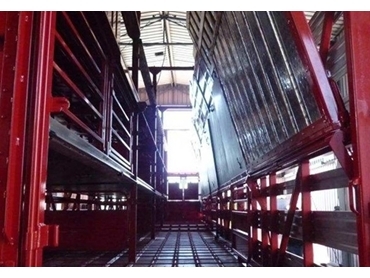 The livestock crates and trailers are equipped to carry sheep and cattle, and they can be used in conjunction with various different trailers. This is model specific, however trailer types include, Single, B-double, B-triple and pig and dog trailers. These incredibly spacious crates and trailers are constructed using high quality materials and the latest technology, so not only are they built to last, they ensure your livestock are comfortable throughout the transportation process.